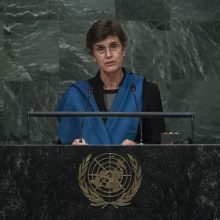 Jill Helke has worked for IOM since April 1999 and is currently the Director of the Department of International Cooperation and Partnerships at IOM Headquarters. She worked in the Office of the Director General from 1999-2009 and was Chief of Mission for IOM in Sudan from 2009 to 2012. Before joining IOM she was in the British Foreign Service from 1978 to 1999, serving at the Foreign and Commonwealth Office in London, the British Embassy in China, and the UK Missions to the UN both in New York and Geneva.